Is The Mitsubishi Evo Destined To Become A Future Classic? It certainly has a pretty good cult-following. Fans of the Mitsubishi Evo need no introduction to the car, but in case you have missed out on two decades of what is no doubt the best thing to ever come from the Japanese car company, then we will fill you in. 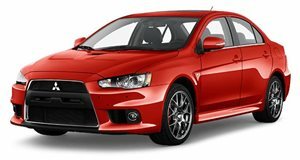 The Lancer Evolution, or Evo for short, is a high-performance sports sedan that is based on the rather boring Lancer. The Evo, however, is not boring. There have been ten generations of the Evo, each powered by a 2.0-liter turbocharged four cylinder with four-wheel-drive. The Evo started as a Japanese-only model, but eventually made it stateside. If you live somewhere else in the world, then you may not see what the big deal is about owning an older Mitsubishi Evo. However in the US, the Evo VIII was the first model we ever received in 2003 because of the massive success of the Subaru Impreza WRX which had been released one year prior. The full history of the Evo is extremely detailed, so we won't cover it all here. We have covered some of the in . Unfortunately, because the US didn't receive any Evo models before the VIII, our market is quite different from markets like Europe, where an Evo IV may not seem so spectacular. Because these cars were forbidden fruit in the US, their value might be a lot different. In the United States, we aren't allowed to import cars unless they are at least 25 years old. This means that even the Evo I (1992), won't be eligible to be imported legally until next year, 2017. The last Mitsubishi Evo, the X, after 2015, and any successor will probably be hybrid SUV. This means that the only Evos that you can buy in the US are the VIII, IX, and X. The Evo X was sold from 2008 to 2015, and was by far the most mainstream version that we recieved. The Evo VIII and IX were sold from 2003 to 2006, and from the high $40,000s to under $15,000 for a very high mileage example. Finding a good one isn't that easy though. The Evo has a reputation for being a tuner car, so many Evo models have been heavily modified. The car was never known as the most reliable car in the beginning, and plenty of previous Evo owners have probably dabbled with increasing the boost on the turbo with various levels of success. An extremely pristine Evo can run you over $30,000 with low miles, which may seem like a lot for a decade-old sedan. In the US, the Evo VIII had 271 horsepower and the IX had 287. Both are more powerful than a brand-new Subaru WRX (268 hp). We never received special models like the FQ-400, which could actually keep up with supercars like the Lamborghini Murciélago. In this impressive test, Top Gear's the Stig managed to set a lap time in the Evo that was just 1.1 seconds slower than the Lamborghini - even on a damp track! We think that the death of the Evo will only help their collectors' value. Soon, older versions will be eligible to be imported into the US and, like the Skyline, will start to go up in value. When special models like the FQ-400 are eventually old enough for import, they will likely see tremendous price increases in the US market as well. The Mitsubishi Lancer Evolution was certainly a special car and we have no doubt that it will become a future collectible.